The Cape Town Waterfront is a smart renovated harbour area, edged with shops, restaurants, pavement cafés, offices, hotels and apartments. 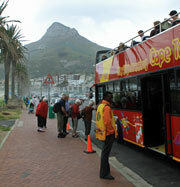 The majority of tourists to Cape Town spend some time at the Waterfront and help create a buzzing atmosphere. Here you will come across bands playing music, street entertainers and musicians. There are various boat and fishing trips to book from at the quayside, tours, an African Craft Market and souvenirs galore. 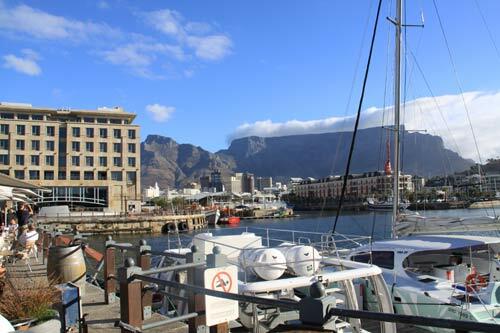 It's from the harbour near the clock house that ferries transfer tourists to Robben Island and back. Most people simply browse the shops, eat and drink at the restaurants and enjoy the sights and sounds of the Mother City. There is plenty of parking in undercover garages which is well signposted. The open topped sightseeing bus tours pass this way and stop near the craft market. There is an 'Out of Africa' shop at the Cape Town Airport departure lounge that also sells good quality items if you forget to buy a gift for anyone.